Kerikeri pours a bright golden with orange highlights, with a good white head. Zesty and citrusy american hops hit you upfront, followed by additional aroma depth from the oranges and grapefruits. Good body and well balanced. With 41 IBU’s, it’s dangerously refreshing and a master of disguise hiding the 7.1 ABV effortlessly. This is IPA is crafted for all seasons, which means that the citrus we use will change depending on the time of year. Whether its Waimuku grapefruit, Harwood Oranges or the Poormans’ Orange, Kerikeri will always have vibrant taste no matter when you drink it! In early 2015, my dream of starting a fledgling brewery was crushed. A series of unforeseen and unfortunate business circumstances had left our funds completely depleted. I recall contacting Carlos, asking him to meet up at the Britomart where I was going to tell him personally that it was over. We met up at noon and we sat on the makeshift grandstand on the Britomart lawn they constructed for cricket world cup. I explained the situation to Carlos, and told him I did not see any future our venture. It nearly ended there. ‘We can still do this’ Carlos said. He explained to me that we didn’t need a big facility or fancy packaging to make good beer. We could lease the space from another brewery and sell them in kegs. If the beer is good, people will take notice and we can start putting them in bottles. Over the next months we were born again as Outlier Cartel. We worked on this new business plan together. We needed to create a good beer to the market. But we didn’t create a good beer. We created a great beer. I was gobsmacked by the taste. If I had any doubts about Outlier Cartel success, it ended after my first sip of Kerikeri ’round the corner. I knew from that point onward we had something special. More than that, this was a beer that was bigger than Carlos or myself – our friends, family and friendly neighbours around Mount Eden all contributed to the making of this IPA. An entire community contributed to picking grapefruits from backyard gardens to zesting the skins. 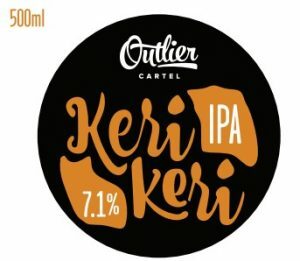 On the 4th of December, we publicly launched Outlier Cartel with Kerikeri and officially entered the world of craft beer. Kerikeri has become our flagship beer. Since then we’ve been adding new beers to our lineup, but to us, this beer made it all possible. We’ve all been through hard times, and god knows, success can be forever fleeting butterfly to catch. But sometimes, its just ’round the corner.